Hyper-Dispensationalists use Acts 28:20 to prove Paul went to the Jew first during Acts because he was continuing the Kingdom gospel. Later, he supposedly got the full message of the “Joint Body” at some point in his prison ministry. “The hope of Israel” is Christ Himself as the Old Testament references prove. The additional aspect is that the hope is not just of Him as a Person who was a “minister of the circumcision”–but the fact all Neo-Bereans have missed: why Paul went to the Jew first in Acts. I think all would agree that the “hope of Israel” is Christ. It is in the definition or meaning of what that hope was, and how He was preached, that makes a large gap between Hyperism and Bible right division. Paul did not go to the Jew first with the same message and baptism of the Kingdom like the Twelve, as all Neo-Bereans claim. Paul’s Acts ministry was to continue God’s far reaching promises and also to complete two prayers: the Lord Jesus’ prayer and Stephen’s. “Father forgive them…” Jesus’ prayer guaranteed the early Acts re-offer of Kingdom in Acts 1-7; Stephen’s message sealed the nation’s fate on the national level but his prayer was consistent with God’s plan and opened the way for that generation of Israel, although cut off nationally and racially as the physical seed of Abraham, to be in the Body of Christ. Another apostle with a different message, Paul, called in Acts 9, MUST get a remnant into the Body of Christ by GRACE–or else there would be a failure on God’s part to fulfill the Abrahamic Covenant (AC) of blessing to the nation during the long Church Age. The AC was not just national blessings to a nation, but (1) individual to Abraham (2) to his seed (3) and universal. It is in the universal and national area of the AC that God dealt with the nation. If the nation of Israel had been shut out totally after Acts 7, they would have been like Sodom and Gomorrah, and a generation of Israel would have received no opportunity of salvation, and therefore, the LORD would have broken the unconditional promises in the Abrahamic Covenant. Therefore, the “blasphemy of the Holy Ghost” unforgivable to that generation of Israel under the Kingdom gospel, was pardonable to that same generation of Israel under the gospel of the grace of God. This was a “short work” and only a “remnant” of the nation would be saved by grace but it would fulfill the promises of God, the righteousness of God, and the justness of God. In other words, the calling out of the remnant by Paul in his Acts ministry demonstrated that God kept His unconditional promise of blessing to the nation, as well as His justification to cut the nation off after the remnant was saved during the Acts period. Hyperism takes the easy way out and assumes Paul was confused or ignorant, or following the crowd in his Acts ministry. They get hung up on a few verses in Ephesians and develop their divided doctrine from there. Every Neo-Berean who claims Paul’s baptism was the same as Peter’s, whether that claim be the message, mode, or meaning of that baptism must accept the classical Greek definition of baptism, change the English KJB by the Greek in multiple places, base their doctrine on one small section of Biblical revelation, and assume the Scriptures say what they want them to say! ALL scripture is inspired (living and breathing right now) and is profitable for doctrine. No Hyper believes that Genesis 12 is coming from the mouth of God right now. They study the Bible as they would any history book in practice but give lip service to believing “every word that proceedeth (present tense)”…Matthew 4:4: “But he answered and said, It is written, Man shall not live by bread alone, but by every word that proceedeth out of the mouth of God.” The Hyper’s exegetical method is to treat the verb as past tense, proceeded, as though God said something in the past but it no longer has any living force. This is why their “rightly dividing” is wrong division. Right division does not chop out any verse in doctrine or application. All the Bible stands or falls equally. We are not to think of division this way: “God said IN THE PAST to Abraham…Moses… in the OT and Jesus…Peter…Paul in Acts…BUT TO US HE SAYS RIGHT NOW IN EPHESIANS, PHILIPPIANS, COLOSSIANS..” God is speaking the whole Book to whomever has any part or whole of it at any time. We do not say we are to build an Ark or keep a sabbath–those are works clearly given to someone else-NOT IN A HISTORY BOOK–but in a living, breathing, eternal message. The old saw of the Hyper: “Not all the Bible is TO me, but all is FOR my learning” is just an excuse to do what they want with whatever they want. Proper division does not strictly say “This is to me” “That was to Israel” “That was to Peter” “That was to John” “This portion is to me” “That is not to me” etc. When division is over-emphasized, it is actually taking away from the word of God and adding to the word of God something He never added! Even in simple math, division of a number does not change, add, subtract, or make one part more important or a portion carry more force than another part. The number remains the same throughout. Dividing anything is not to remove the importance of anything. 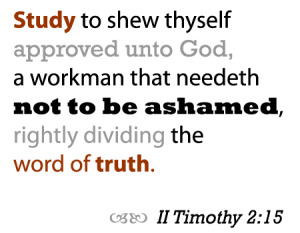 The purpose of rightly dividing the word of truth is not to remove, change, alter, or diminish any part. The primary purpose of right division is to “shew thyself approved unto God”, it is not to find a Pauline truth over which to split hairs and fellowship with other believers. “Diminish” is not simply a synonym of subtract or “take away”, diminish is to leave the verse but reduce the present force of it. Bible believers should realize that Hyper-Dispensationalism came out of the mid 1800’s Bible criticism and the lies of “oldest manuscripts are best.” Hypers developed their exclusive doctrines in the 1800’s with Bible correctors such as Charles H. Welch, E. W. Bullinger, and their followers in the 20th Century: J.C. O’Hair, Cornelius Stam, E.C. Moore, (all deceased) as well as the current ones. Not one of the men believed the King James Bible in English. After he became a hyper, E.C. Moore told me that Hebrews 6:2 should read “baptisms” instead of “washings”. Cornelius Stam said the same to me in correspondence. J.C. O’Hair said, “We say to you very frankly that you must forget the word ‘church’ in the Bible, if you want to know the Bible Truth concerning the Body of Christ.” (The Unsearchable Riches of Christ, Berean Bible Society. Chicago, IL. p. 216). Again, we do not mean there is no difference between Israel and the Body of Christ, or that all doctrine is congealed into one big spiritual smorgasbord. But the Bible is not a Book to be handled like a natural history book either. Spiritual words are not of human origin and therefore are not to be treated as from man. Jesus said: “It is the spirit that quickeneth; the flesh profiteth nothing: the words that I speak unto you, they are spirit, and they are life.” (John 6:63 KJB).